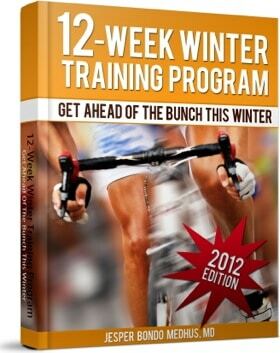 Now it is more than 4 months since I launched the updated version of my popular 12- week winter training program. 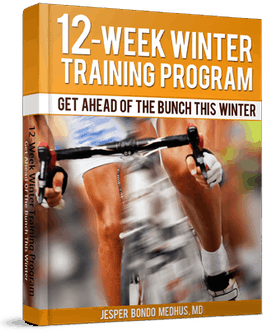 The 12-week winter training program has actually been available since 2007 as a free version. Because having thousands of users leaving feedback for me about this training program, I’ve gained more information than it is possible for me to get through individual coaching. Because so many riders tried my different versions of the winter training program (and gave me important feedback), I have been able to develop the ultimate winter training concept. The old version didn’t have any training zones for pacing, but used generic terms to describe intensity: ‘hard’, ‘very hard’ etc. That way all cyclists were able to use the winter training program (and leave feedback for me). Though, it has also been my experience that many cyclists misunderstood vital parts of my training strategy because of this. Most riders use a heart rate monitor during training as their primary tool for pacing during intervals. That’s a great tool for pacing, but it is now clear for me that I should have been more precise about what intensities I wanted people to train with during the winter. The 12-week winter training program is not only a training program, but also an e-book packed with additional information about the reasoning behind the training program. There are more than 102 pages in the new version. Here you can increase your knowledge about the strategies I use in the 12-week winter training program. Now I’ve found a couple of unique training methods that help a broad range of riders. And it is easy to customize so it fit into your daily life. So the training structure I recommend benefit elite riders as well as 60 year old recreational riders. It is a training system that has been helpful to people who have “seen it all” when it comes to cycling training. One more thing that I’ve learned from my readers is that every individual is… an individual. We are all different. We all have different physiological talents, different goals and perspectives. And that’s why I decided to offer individual email support for this training program. Because I can help people achieve their goals (and continue to gain information about what challenges people struggle with). Take, for example, Jakob Bering. He is not a standard athlete. Actually, he has been representing the Danish National team as U23 rider, won the team competition in Tour de l’Avenir, 2x gold medal at MTB Junior National Championships etc. Probably, he’s the rider who have tried most (if not all) of my training programs and strategies. This winter I decided to let him try the 12-week winter training program as it would work for all other athletes who download this e-book. He didn’t have access to any additional coaching options or else. Proof that the 12-Week Winter Training Program is NOT just more of the usual suspect info. It is no secret that Jakob Bering knows my training philosophy in and out, so it wasn’t a big surprise for me that he liked the program. Thus, it has been even more enjoyable for me to see that so many other riders have improved their endurance this winter 2011/2012. I noticed my HR was significantly lower than in the past-staring mostly in my endurance range or in my sub-threshold range-rather than how it was in the past (nearly all in the sub-threshold or threshold range, creeping up into the V02max range before I would blow myself up and get dropped). I also noticed my HR would recover much quicker and to a lower range than in the past. In short: my fitness has obviously improved greatly! I’m thrilled. 🙂 and my threshold power has increased by 60 watts (30%) My average power output with general riding is also up by 25%. Amazing what a little focus can do. This book is well laid out, provides the relevant detailed information for a rider from 4th through to 1st Cat, to structure and develop themselves and their commitment to training and racing into a productive and professional system. 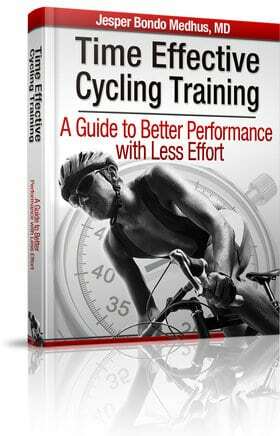 We would recommend this book to all levels of cyclists. Enjoy the miles! The 12-week winter training program is currently priced at $37. Since this price includes free email support from me, it should also be obvious for everyone that you get value for money. And at $37 it is a bargain: in fact, it costs less than a decent cycling helmet. The 12 week training program gave me structure to my off season workouts. I’ll use it again next year, worth the money. I also followed the program this winther. Absolutely loved it. Have moved up in the internal club peleton significantly. I like the structure and the intervals – having a hard time finding time for the long endurance rides. My vo2max was 59 during a test last month. In my agegroup that is just below World elite. Thank you very much Jesper. Does this program rely on having a power meter? Does it use a HRM? It would be good to know what to expect and this blog post doesn’t do it. @Dan – Most riders use heart rate monitor as their main pacing tool for the 12-week winter training program. I agree that power meters are invaluable tools for pacing control and interval sessions, and are especially useful for tackling time trials. But the bottom line is that they are not absolutely necessary. And you certainly don’t need one to tackle the 12-week winter training program. Interval sessions can be performed using just a heart rate monitor. In fact, it is clear that is what the majority of my readers do, and only one in seven tend to use a power meter like SRM or Powertap. Of course, it is obvious that something as important as pace control is easier to do with a sophisticated power meter. However in the majority of cases it is possible to learn how to find the correct pacing for sub-threshold /threshold/VO2 max intervals using a heart rate monitor. If possible, I recommend riders to use an ergometer bike to track their progress before / after entering the training program. It’s an easy and reliable (and affordable) way to get access to info about your current fitness. Thank you! I only own a HRM right now and am on the line about the power meter. I understand their utility but I’m not convinced the price is worth it. If I can perform this program with just an HRM I will be buying it. I couldn’t be happier with the results from using Jesper’s 12 week winter training program. When I started the program, I had a peak 20 minute power of 168w (I’m very small and light at only 60.5 kg for initial test, 59.0 kg for final test) and couldn’t complete the full 30 minute test because I blew up. This equated to a 2.77 w/kg rate. At the end of the program, I retested at 202w for 20 min, which equaled 3.42 w/kg, which was an improvement of 20% over my baseline test! I was hoping to maybe raise my power up to 180w-if things went well, but was thrilled to see my power increase as much as it did. I followed the program as best as possible, but had limited time so I never did the weds rides as 4 training days a week was all my life could sustain. Shortly after the program was over, I entered my very first race (a super criterium on an automobile road race course of 1.7 miles). My goal was simply to not get dropped by the pack, to stay near the front (if possible), and watch the race clues from my friend (a much stronger rider than myself). Being a sprinter I knew it was vital for me to pace myself during the race and only do the work needed to stay positioned well without doing anything extra. I hadn’t had a whole lot of illusions about doing well my first race, so I hadn’t really given much thought to sprinting for final placing. Well, as it turns out, my friend who I was watching for race clues, ended up winning the race, and I was not far behind taking 9th place overall! Looking back at the pictures, it is also very clear that I got boxed in by a ‘wall’ of 5 riders spread across the track coming down the final straight-which prevented me from even sprinting at all. Given my strength at sprinting, I would have easily passed this ‘wall’ of riders before the finish line, thus placing in the top-5 for the race, if not even better. After this race, I was hooked and still very much in disbelief at my newfound fitness level. Since then, I’ve attended several group ‘race rides’ with the local club. In the past 2-3 years I could never hang with the group for a full ride as my aerobic and threshold fitness just wasn’t up to task. This year, it’s a whole different story! I can not only hang with the racers now, but am finally getting the confidence to even contest (and win!) some of the ‘stop-ahead’ sprints! I would never even attempt these sprints in the past because I knew I would blow up and just get dropped after sprinting. Now however, my HR drops very quickly and recovery occurs while I’m riding back in the pack-within a very short time. The transformation has caught the attention of several racers in the pack who’ve asked me several times if I’ve been training over the winter, and others making comments to the end that I’m a ‘totally different rider’ this year. In summary, this program is easily worth 5 times the money and the results are beyond expectation (for me anyway). I had very limited time to train this winter-never exceeding 8 hours of training any given week, and mostly more like 5-6 hours total/week. However, they were very specific, targeted training hours that were very purposeful, and the results speak for themselves. Jesper has also benen very good about providing email support to answer the few questions I’ve had. I can’t recommend this program highly enough! Thanks Jesper!!! I used your Time Effective Cycling Program this past season. I am a Downhill Racer (recently competed at the Masters Worlds in SA.) and found the program very useful. Loved the 14 day VO2 max booster program. I have just purchased the 12 week winter program for the upcoming 2014 season. I plan to start the program in October. my question is, what do I do after the 12 weeks? do I start over? do I throw in a VO2 max booster program- then start over? I am sure I am not the only one who is wondering this. For a long time I’ve been working on a follow-up program that can be used after the 12-week winter training program (a specific pre-season training program). My macbook pro was stolen last month, so I have lost both my manuscript and several unpublished articles and chapters. Who cares about backup? Anyways, I hope to get some kind of pre-season training online in the end of february 2014 if things turn out right. Er 12 ukers programmmet tilgjengelig på dansk…? Hei, er 12 ukers programmmet tilgjengelig på andre språk, neppe norsk men kanskje dansk..? English only. It will be translated into japanese in 2014, but I guess that won’t help you. Hi Jasper is this program also based on HIT principles or traditional base building ? If the first applies, isn’t it early in this time of season to do intervals above 80-85%? The 12-week winter training program is designed for riders aiming for 10hrs/week after finishing the program. You can easily adjust the training volume so it fits you perfectly. Most riders decrease/increase the total training time so it matches their ambitions and available time. However, I always recommend to keep intervals untouched and use the time spend at endurance intensity as buffer for adjustments. I’m very interested in your Book but in the Winter I do a lot of other Sports like Tabletennis and running. Also every Sunday here in Münster is a very intense 2h Groupride the first hour is easy but the Second is like a Race with over 40km/h is it possible to integrate this things in the Plan? Jasper, I purchase the 12 week winter training plan sometime back and plan on using it this year. I would like to add some hours to the plan. How would you suggest going about adding hours to the plan. I have the 2012 version, is this the latest version available?